But the fact is that moving is quite a challenge in one’s life and that it includes much more things than you can imagine. Even when your move is a local one, hiring reliable movers Ontario is the best choice you can make. We are one of the best movers in Niagara Falls Ontario, and our job is to provide you with stress-free moving experience! Our customers say we are pretty good at it, and we are doing our best to never stop learning and improving our skills. Premium moving services we offer to cover every step of the moving process. The team of our experienced movers Niagara Falls will pack and move your belongings safely. And you don’t have to worry about purchasing packing boxes, we will provide high-quality boxes ourselves. A local move can be just as stressful as long distance move. Because even your new home is not that far, you still need to relocate your entire household. That is why you need professionals by your side. They will know the best method to safely transfer your belongings, choosing the best route and saving your time. Our movers Niagara Falls know this place like the back of their palm. Hence, they will be able to perform the move much faster and efficient than you would do it yourself. Our team has years of experience in local moving and expertise in residential moving, which makes us one of the best local movers Ontario. Most importantly, we know how important your personal belongings are, hence, we treat them as if they were our own. You don’t have to worry about your delicate items, we will treat them with special care. And it doesn’t matter if you are moving a single room or entire residence, best movers in Niagara Falls Ontario are up to the challenge! People often forget that packing is a crucial part of the moving process. Because only properly packed items will be safe during the transfer. Things that haven’t been packed properly have more chances to get damaged or broken. Our movers Niagara Falls have special techniques they use to pack and protect your possessions in a way they are ready for the transfer. Not to mention that our packing services will save your time, money and nerves. Why would you bother with purchasing moving boxes if we can do that for you? You can use your time to deal with some more important things, and leave packing to one of the best movers in Niagara Falls Ontario. We know exactly how to pack each item and which box size to use in order to keep it safe during the move. Furthermore, our moving boxes are of the highest quality. They are endurable and sturdy, and they can safely carry any type of cargo we put inside. But even with the best packing materials, you need to know how to use them. Our packers know how to use all their space but not to overload them, and keep the weight within the recommended limits. Although 30 million tourists every year come to visit Niagara Falls, this place is much more than a tourist attraction. There are three waterfalls: the American Falls, Bridal Veil Falls, and Horseshoe Falls. They all meet to create the biggest waterfall in the world. Besides this stunning scenery, there are many unique restaurants and bars. Visitors of the famous restaurant Skylon Tower appreciate a fantastic view, giving an amazing perspective on the falls. And if you want to eat close to the action, visit the Fallsview Buffet Restaurant. With its beautiful view, scenic views, you can almost feel the mist on your face as you dine. History lovers are definitely never bored in Niagara Falls. They can explore Old Fort Niagara, with its underground gunpowder rooms, army barracks, and ancient cannons. Additionally, they will enjoy their visit to the McFarland House, Niagara’s oldest property grounds, and get a taste of authentic Georgian lifestyle. This place has the ability to take you back in time. 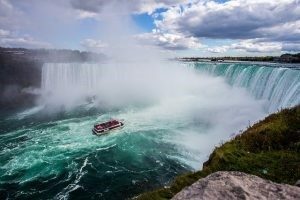 Interestingly, Niagara Falls has many activities that will make you step outside of your comfort zone. The most popular one is definitely the “Maid of the Mist”. This is a boat tour that begins on Niagara River and ends in the dense mist of the American Falls. You can expect to be completely soaked by the end of this exciting tour. And if you really want to get your heart pumping, you can try zip-lining over the gorges of Niagara. Our crew is at your disposal for all the questions, concerns or special requirements. Don’t hesitate to ask us for help, we will be glad to assist you in finding the service that suits best your needs. We would love to hear your vision, in order to meet your expectations to the fullest! Our mission is to deliver a premium moving experience, and customer satisfaction is our biggest award. Hence, the more you tell us about your wishes, the better plan we can make to fulfill them. There are many ways to contact us, and we will happy to help you out whichever way you choose. You can give us a call, send us an email or visit us so we can plan your move together. Best movers in Niagara Falls Ontario are waiting for you!